In several recent posts, I have written about the probable presence of Homo erectus in America and in doing so mentioned several probable sites and findings ranging from Mexico to Brazil and Central Argentina. Alas, I have not yet mentioned Patagonia and the implications that Homo erectus may have had if they managed to survive in that region until more recent dates (i.e. long enough to contact modern humans). Stone tools from sites in Mexico and the US dating back about 200,000 years to pre-Homo sapiens times. Bones: "robust" skulls with thick supra orbital ridges (brow ridges) unlike those of modern humans but similar to erectus', from Brazil and Argentina. Other remains: arrowheads in pre-sapiens fossil megafauna and scorched soil from hearths during the same period. Possible route of entry: either out of Asia through Beringia or out of Africa across the Atlantic in rafts. a. Violent scenario: A group of scouts sights a camp of the other group and a raid is organized to kill the men and or children and carry off the women. This leads to retaliation. 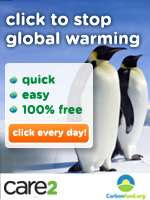 The more numerous (humans) group ends up killing the less numerous one (erectus). This could have taken many years, and the losing side would have moved to more secluded territories, hidden, become reclusive, etc. The winners would demonize the losers in their lore, painting them as monsters or ogres. Children would shudder while hearing the stories told about these blood-thirsty creatures. b. Slow and silent extinction: The modern humans, brainier, would have had an advantage over the brawnier and (slightly dimmer) erectus when both competed for the same limited natural resources. This would have meant that we humans would have occupied and controlled the best hunting sites and places to set up camps. We would have hunted more or better prey leaving the marginal resources and less fruitful sites to the erectus. Maybe direct face to face contact was limited and startled both parties. Perhaps disease brought into America by modern men also wreaked havoc with the erectus just like it did with the American Indians when the Europeans arrived in the 1500s. Millennia of separation and isolation led them to be defensless when confronted with simple ailments such as measles or the common flu. The inevitable outcome: extintion of the local erecuts. If the Paleo-Indians met erectus they would have depicted them in their art. Their Indian descendants would keep on reproducing these motifs even though they had never seen a live erectus. Their prominent supra orbital torus (brow ridges) would be the most conspicuous element in these representations, being the feature that characterizes our distant relatives. 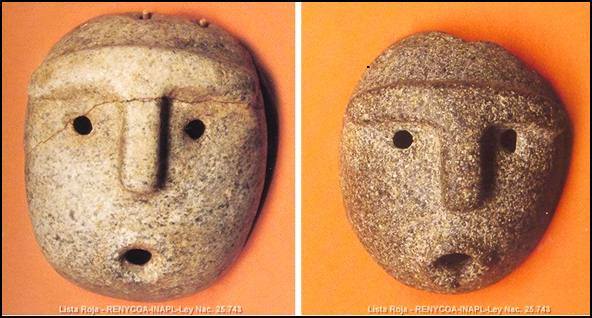 Below are two stone masks depicting people with heavy brows. These masks belong to the Early Formative Period (Período formativo temprano) from 500 BC to 600 AD in the Argentine provinces of Catamarca and Tucumán (Northwestern Argentina) over 800 km (500 mi.) from Patagonia's northernmost tip. The Mapuche natives of northwestern Patagonia also represented erectus-like monsters in their art and religious artifacts. And these were definitively Patagonian Indians. Did erectus live in the Andean forests? How long ago did they die off? The Mapuche, like many native Americans carved "totem" poles. These had different names and uses. The "Rehue" was a sacred site whose main element was the "Kemo" a shamanic pole or sacred tree trunk, carved with steps, actually a “step-notched pole”  was also known as "Praprahue" (Mapuche word for stairway or ladder). The trunk was decorated with colored ribbons and branches of sacred trees (canelo and quila). Other minor ritual elements make the place sacred. A feature of the "Kemo" is that: "between the last step and the upper platform a human face is chiseled into the Kemú, on top of which a top hat is usually sculpted, which becomes the upper platform" . 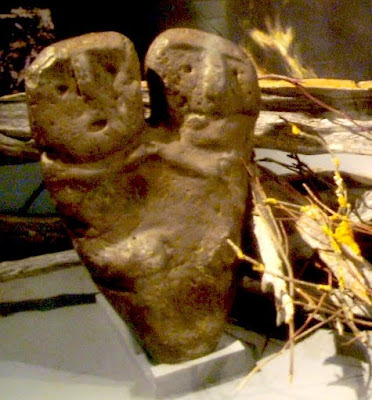 Similar wood carvings are found at Mapuche burial places and they were known as "Chemamüll", meaning (che = person, mamüll = wood) "wooden man". They are not "Kemu". The text above is interesting in two ways, one that it links Mapuche beliefs with those of the Siberians (Mapuche Indians are, descendants of the in my opinion more “modern” wave of Asian immigrants into America some 15,000 years ago, who displaced an older Homo sapiens migration – of which perhaps southern Patagonian natives were the last remains until they too disappeared in the early 1900s). The second interesting aspect is what I highlighted in bold font above, the “face of her familiar spirit”. If you take a look at the "rewe" images below, you will see that these faces are all very similar and depict a human-like being with heavy brows which make the eyes appear as deeply set. Detail of "Museo Naturalista Dillman Bullock, Angol". Copyright ©katyta.liraz. 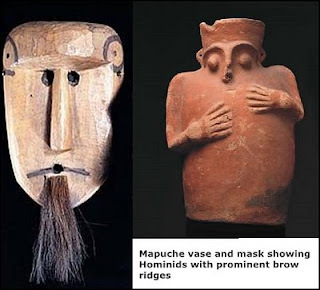 There seems to be plenty of evidence in Southern South Americas native American art, depicting "humans" with prominent supra orbital torus and sloping - tiny receding foreheads. These are definitively H. erectus traits. If they were depicted that means that they had been seen, though when, we can not know, and, (this is a point against my theory) they may have even seen them in Asia before entering America - which, would mean that erectus never reached America and that these stone or wood effigies are just ancient memories of an encounter between modern man and erectus that happened somewhere in Eastern Asia. However, there is the chance that the Paleo-Indians or their Indian descent met erectus here, in America, and that these roughly sketched portraits in stone, wood and clay are the memory of that "meeting". Image credits: Máscaras. 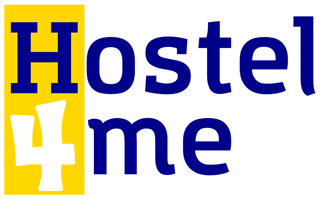 Colección Ministerio de Relaciones Exteriores, Comercio Exterior y Culto. Raúl Díaz Acevedo, (2006). Rehue: Un espacio sagrado. Online. Idiófonos. Revista del Gabinete de estudios etnográficos. April 2006. Arvind Sharma and Katherine K. Young, (2001). Annual Review of Women in World Religions, the, Volume 6. Suny Press. Rise of the Machi-Moon Priestess. pp. 213. Adapted from photographs taken at the Museo de Arte Popular José Hernández during the “ Muestra de Arte Mapuche, 2007”. 15.07.2007. by Porteña. Mask: Semillas de Chile Exhibition, Beijing, Citinga: Tercera de Chile. Vase: Same exhibition, but another online source. [ Katyta.liraz. Flickr posting. 01.10.2008 Museo Naturalista Dillman Bullock, Angol.